Updated Thursday October 11, 2018 by Beamsville Minor Baseball Association. BEAMSVILLE MINOR BASEBALL NEEDS YOU! 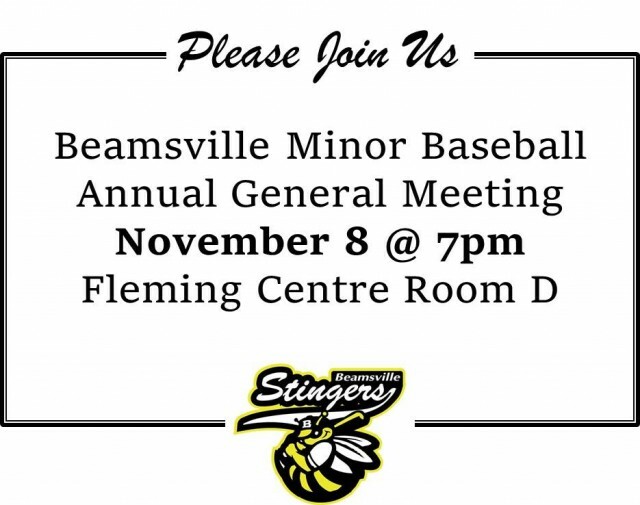 Beamsville Minor Baseball Association (BMBA) would like to invite you to our Annual General Meeting on Thursday November 8 at 7pm, at the Fleming Centre (Beamsville Arena). This meeting is your chance to hear about the current state of our association, and most importantly, to become an active participant in the future of the association. If you are interested in becoming involved or have questions about our association, please plan to attend. BMBA is continuing to grow each and every season, and is run entirely by volunteers. Your support, in time and energy, is needed so that we can continue to offer a quality ball program for our community’s children. This year, the following Executive Committee positions are up for election. The commitment for Executive members is attending regular Executive meetings and your choice of position(s) from the list below. If you have any questions prior to the meeting, or would like to stand for election for one of the above positions, or nominate someone (with their knowledge) please email Derek Rickard, President BMBA at dsrickard44@gmail.com. Nominations from the floor are also allowed. If you cannot attend the meeting but are interested in joining the Executive, please let me know prior to the meeting.